Our kitchen window was bursting with basil plants and sort of like “the Day of the Triffids” as they were out of control and growing like mad despite the neglect after being away for a week. 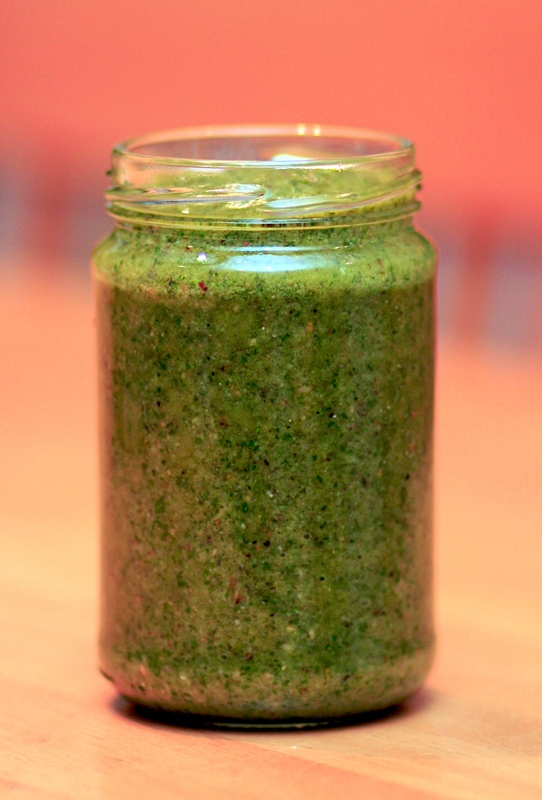 So if like us you have some basil on your windowsill then make pesto – those leaves aren’t going to last forever! This makes about 250ml and will keep in the fridge for a couple of weeks. You can expect some pesto recipes from us to follow. Heat a small frying pan over a low heat. Cook the pine nuts until golden, shaking the pan. Keep an eye on them as they burn easily and very quickly.Put the toasted pine nuts into a food processor along with the rest of the ingredients and process until smooth, then taste and season. Pour into a jar and cover with a little bit of extra oil and store in the fridge. Keeps for around 2 weeks – ready for instant dinners like the one below.